I was not planning to go on the night dive. It was the first night of the trip and I was a little tired, I already had my camera batteries charging and was all settled in with a book for the night after a fabulous first day of diving with turtles, sharks and tons of fish. But Fernando, our dive guide, told me I had to go. Usually, when the dive guide says you have to go, you better go, so I put my camera back together and I was ready in record time. 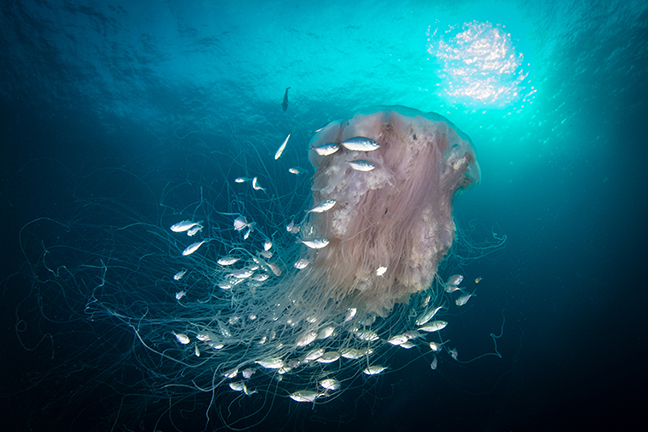 Large lion’s mane jellyfish, with tiny juvenile fish swimming among its tentacles for protection at Devana Kandu, Maldives. Photo by Brandi Mueller. 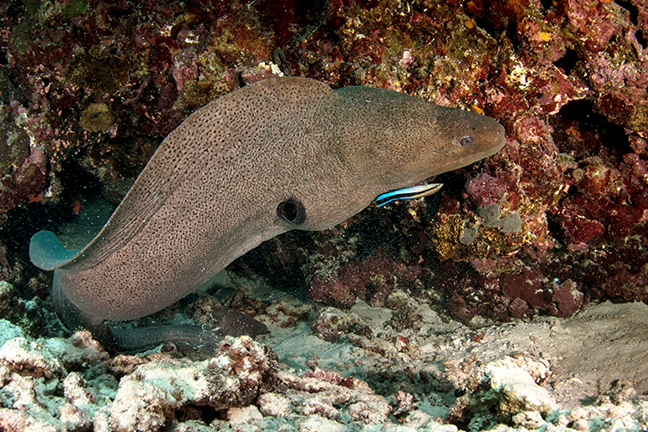 The dive site was Alimatha Pier at Vaavu Atoll. We did our giant strides into the black water and were immediately greeted with a ripping current. They said to bring reef hooks if you had them (which I did not), so after getting to the bottom, I found a rock to hold on to. Getting comfortable, I looked around. There were giant white shadows against the inky black water. 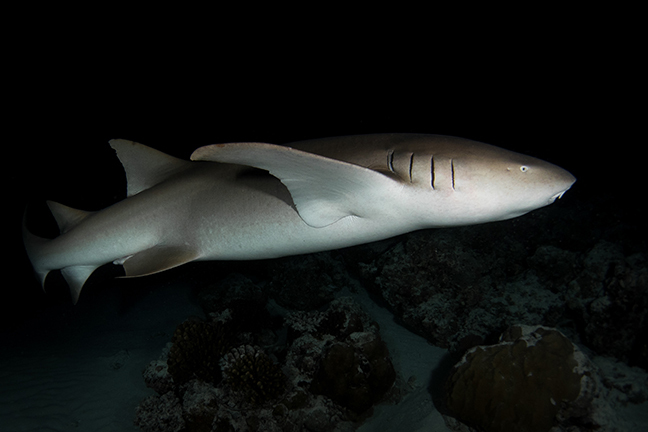 Moving my light around, I saw them—massive nurse sharks. They were in front of me, behind me, and above me. Then a stingray glided over the sand like a magic carpet flying by, right next to me. Hunting trevallies were making use of our lights, whizzing by us and making that whooshing sound before devouring the fish our lights lit up for them. All the while, the current was rushing by, making it hard to stay in one place. The dive took place on a sloping bottom that went on for about 10-15m (30-50ft) and then there was a steep drop-off. The drop-off was to my right, and at one point, I looked in that direction toward what would be open blue if it were not pitch black, and my lights just barely lit up the white bellies of more sharks than I could count. My entire view was a wallpaper of nurse sharks, ghostly white shark-shapes in the black. It did not even look real. When our air was nearing empty, and we were forced to leave the sharks, we came up from the dive cheering. Still high on adrenalin, we looked up at a million stars on the moonless night in the middle of the Indian Ocean as we waited for the dhoni, a traditional fishing boat re-purposed for diving, to pick us up and take us back to the Blue Force One, our home for the week. I was so glad I went on the night dive. Flying into the Maldives feels like you are flying over blue for ages. Endless sapphire stretches on and on. Once the pilot announced that landing was about to begin, specs of green ringed in white started showing up. Stretching 760km (472 miles) from north to south and 120km (75 miles) east to west, there are over 1,200 picture-perfect islands in 26 atolls. It is hard to deny the romance of these tiny green specs of palm trees with sugary-white sand beaches surrounding them, most of which are uninhabited. Not to mention, the diving is said to be incredible. A destination that has been on my bucket list for years, it is hard to not dream of visiting these faraway islands in the Indian Ocean. I felt a certain giddiness as the plane landed in Malé. Stepping outside of the cold plane into the equatorial humidity, I knew my next week diving in the Maldives was going to be fantastic. Leaving the airport, I found some of the crew, and as we set off to the boat, I realized the airport had a pier. We did not even have to drive anywhere to get on the boat. We simply crossed the street and got on a dhoni, which would take us to the liveaboard, our home for the next week. The Maldives is a pretty big bucket-list destination. If you are going to do it, you might as well do it in style, and the Maldives Blue Force One is definitely that. It is, by far, the most beautiful, spacious and comfortable liveaboard I have ever been on—a true luxury yacht made for scuba divers. The rooms were amazing too. My bathroom was larger than most entire cabins on other liveaboards, and I was just in one of the normal rooms. The boat has a master suite, master cabin and a junior suite as well. My bathroom had a large shower, with optional rainshower head, plenty of room to move around and a large sink with drawers for storage. The rooms were also very spacious, the beds were comfortable, there was good air-conditioning, and each cabin had its own TV, although I never once turned mine on. Some of the suite cabins had full bathtubs, and three had their own in-room jacuzzis and large sea-view windows. The boat can take 22 passengers and has a crew of around 16. Twenty-two sounds like a lot of people, but the large boat never felt crowded. In fact, I often found myself the only person on the sundeck or in the salon, as there was plenty of room for us all to spread out and get a little bit of that feeling like we were on our own private yacht. The crew kept everything spotless and they were always there to help get dive gear ready or pour a glass of wine. Three meals a day were served buffet style outside but protected from the sun or rain. The outdoor dining area was a lovely place to drink coffee in the morning and watch the sun rise before our first dive or have that glass of wine and watch the sunset. All the dives took place off a dhoni, the local name for a multi-purpose boat with motors or sails. The original dhonis resembled traditional Arab sailing vessels, and ours was designed perfectly for diving. The 18m (60ft) vessel would pull up along the main boat and we were able to easily board just by stepping across from one boat to the other. All of our dive gear was left on the dhoni and tanks were filled there. When the boat was transiting to other areas, the dhoni drove behind us. Diving from the dhoni made it easy to get to dive sites that might be too shallow for the main boat and most of the diving was drift diving. So, the dhoni was perfect to drop us off at the dive site and then pick us up, wherever the current took us. One delightful touch was that the staff gave us clean dive towels to use on the dhoni every morning. Having separate towels for diving from those in your room is always a nice feature, as oftentimes, dive towels start to get a bit smelly and perpetually damp by the end of the week. Being able to grab a clean, fresh towel every day was fantastic. It was one of the many small details that made diving with Blue Force such a fantastic experience. On arrival day, we spent our time getting settled on the boat and meeting our shipmates. After a lovely dinner, most of us headed to bed early to recover from the jet lag of our long journeys. But we were up bright and early the next morning for our first day of diving. Kurumba. Our first site was Kurumba, just a little way from Malé. This lovely dive site had a nice mini-wall covered in corals and fish, including about a million anthias. We had two gray reef sharks swim by, a playful octopus and even a turtle. Not bad for the first dive. Kuda Giri. The boat then headed to South Malé Atoll to a dive site called Kuda Giri, a nice reef with a small wreck in the sand. There was quite a bit of current on the dive and the wreck almost seemed to be moving due to all the fish swimming above and around the ship in the current. Lionfish were out hunting smaller glassfish. A gang of trevallies were trying their luck at getting dinner, and every time one of them sped into the cloud of fish swimming around the wreck, the cloud would instantly condense and disappear for a second in an audible “whoosh,” and a few seconds later the fish returned to their buzzing cloud about the ship. Miyaru Kandu. Continuing south, we headed to Vaavu Atoll to a site called Miyaru Kandu. The islands of the Maldives are all atolls, which are remnants of extinct volcanic islands. Once an island is formed and stops growing, the ocean goes to work eroding the island. In the end, all that is left is an island ring of former coral reef, with a lagoon of saltwater in the center. There are usually breaks in the circle island where channels have been created and allow ocean water to go in and out of the lagoon during tidal changes. 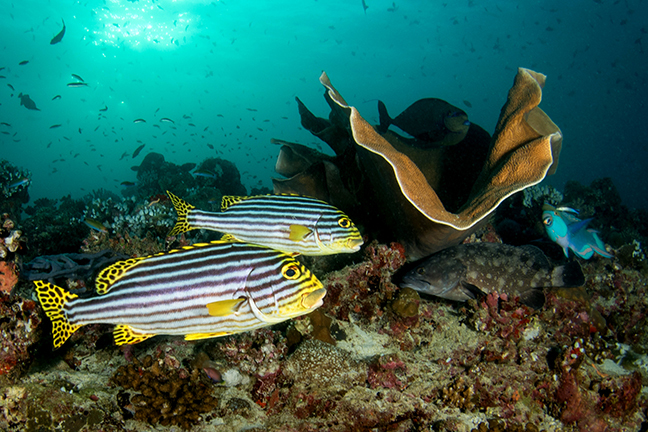 This is where the Maldives’ adventure diving comes into play. At certain times, the influx of water in or out of the lagoon creates a ripping current. Miyaru Kandu is one of these adventure dives. The dhoni dropped us off on the ocean side of the island and the current carried us to the channel opening. At this opening, we used our reef hooks (or held onto rocks). For most of the dive, we stayed in this opening, as the current ripped past us. Sharks and other pelagic animals love these areas where the strong currents are. Once we were hooked in, we just watched the show, with dozens of gray reef sharks, huge dogtooth tuna, tons of fish and even an eagle ray swimming by. When it was time to head to the surface, we simply released the reef hooks (or let go), and let the current take us through the channel to the inside of the lagoon where the dhoni picked us up. Alimathaa Pier. Our night dive was the nurse shark night dive at Alimathaa Pier—most definitely a dive I will not ever forget. Still amped up after the shark night dive, I headed to sleep with dreams of sharks dancing in my head. Devana Kandu. We started our day still at Vaavu Atoll and dived Devana Kandu—another dive with a lot of current—with the hopes of seeing sharks. Soon after getting in the water, we were drifting, and I saw a large shadow off in the distance. Keeping my eyes on it, it soon came into focus and turned out to be a massive lion’s mane jellyfish! I swam after it, and it seemed motionless, just drifting in the current, except for a thousand tiny juvenile fish swimming with it. They scattered about the jellyfish never holding still, while this large mass just led them wherever the current took them. I could have stayed with them the whole dive, just observing the delicate relationship between the fish and the jellyfish as they drifted in the current. The ocean is just amazing, but there were still sharks to see, and I had drifted a little bit away from the group, so I had to kick back into the current to get to where they were. Maamigili and Dhigurah. Next, it was off to South Ari Atoll in hopes of whale sharks. We tried to find them at two dive sites, Maamigili and Dhigurah, but no such luck. I have no doubt they were there, but the visibility was quite thick and green, and they were probably hiding in plain sight. 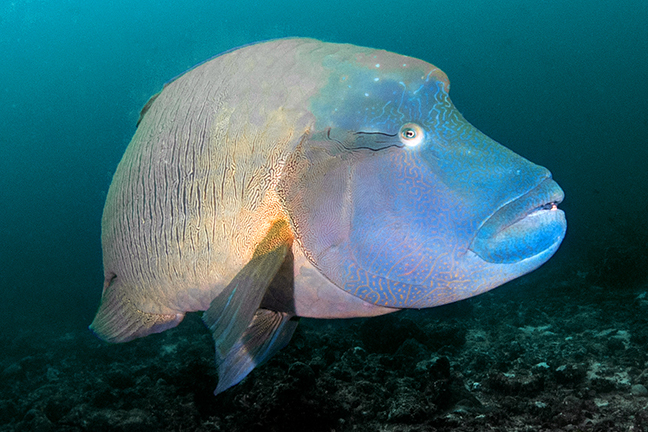 Even without spotting the largest fish in the ocean, we still had two fantastic dives. At Dhigurah, towards the end of the dive, I swam a little shallower, to see what was happening at the top of the slope and came across a lovely balled-up anemone. It was pinkish purple, with two bright orange anemonefish swimming about it. With the sun low in the sky, it was perfect for photography. As I kept snapping shots, I saw my dive buddies swim farther and farther away. “But it’s so pretty,” I thought, “why are you guys not stopping and taking photos of this too?” With one last shot, I swam quickly after them. As I was swimming to catch up, I saw they were everywhere—Over a dozen identical balled-up anemones. Maybe that was why my buddies were not so concerned. Dinner was quite a surprise, as the crew of Blue Force One set up a candlelight dinner for us on an uninhabited beach. We arrived by skiff and were served an amazing meal under the stars, with the beautiful Blue Force One lit up on the water. It was a fantastic way to end the day. Rangali Madivaru. Still at South Ari Atoll, we started off the morning at Rangali Madivaru, with hopes of seeing mantas. A lovely, relaxing dive without a lot of current, we saw a few sharks and two turtles—and at the very end, a manta swam by. Moofushi Beru. Heading to North Ari Atoll, our next dive was at a manta cleaning station called Moofushi Beru. My dive guide told me not to get distracted with the sharks because this dive was all about mantas (it was as if he had already figured me out!). I could not help it though—after descending to about 25m (82ft), there were whitetip sharks just sitting in the sand all over the place! So I spent some time chasing them around trying to get photos until the first manta swam by. 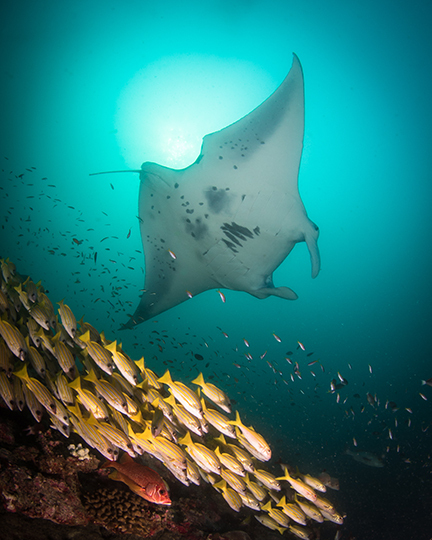 Then I remembered to focus on the mantas and followed the group to the cleaning station. The cleaning station looked like a large round table of coral, with two mantas hovering just above it and tiny wrasse coming out of the coral to clean them. We stayed low on the outside and watched as the mantas slowly seemed to fly in for their cleaning and slowly fly out, making a large circle and coming back again. The dive was so good that I was really happy when they told us we would be doing it again on the next dive. I followed commands better this time, ignoring all the photogenic sharks, and went straight to the mantas on the second dive. So far, we had three out of three dives with mantas—not bad for what our guides told us would be “Manta Day.” But we still had a night dive; for that, we headed to Emadi Maaga, also on North Ari Atoll. Using the dive boat’s powerful stern light to attract plankton, we had two mantas feeding behind the boat before we even jumped in the water. Emadi Maaga. The dive took place right under our boat. As we knelt in the sand, I noticed it was a very fine silt that quickly got stirred up and reduced visibility. We sat in a semi-circle under the boat light and waited. After a few minutes, I had sort of given up on seeing mantas (they might have been there, but the visibility was so bad that they would have to be literally next to us for us to see them). Just then, like a lightning bolt, a manta sailed by, just above my head. It actually scared the bejesus out of me! Manta day was quite a success. After dinner, several of us got a glass of wine and sat at the back of the boat to watch two mantas do their ballet dance of feeding, late into the night. Fish Head. The diving had been great so far, and we kept joking about how the crew could possibly make it any better. Our morning dive was at a site called Fish Head (It also has a very long Maldivian name, but "Fish Head" is a lot easier to spell and pronounce). 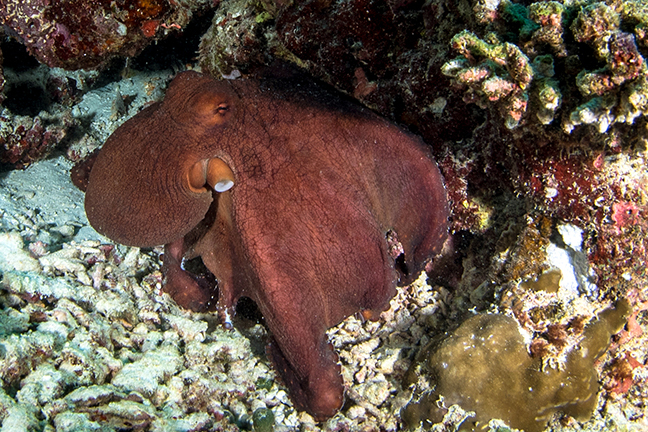 The highlight of this dive for me was a pair of mating octopus, which I stayed with for most of the dive. 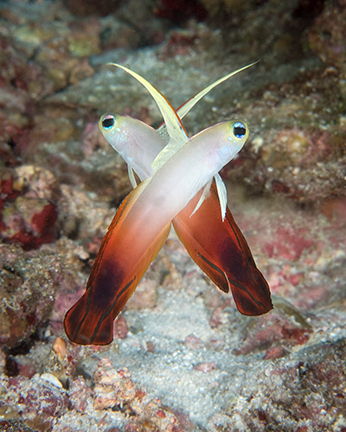 The male would slowly extend his hectocotylus (the male’s specialized arm that can transfer sperm to the female) and he almost seemed to hold it in front of her face for a while before he would wrap his arm around her in an attempt to mate. Bathalaa Maagaa Thila. Next, it was more shark action at Bathalaa Maagaa Thila on North Ari Atoll. A fairly swift current took us over the reef, and whenever we looked out into the blue, there were numerous sharks off in the distance. We also saw an absolutely massive Napoleon wrasse and a few more octopi. Madivaru Beru. Our last dive of the day was at Madivaru Beru on Rasdhoo Atoll, and as the boat moved to the site, a few lucky passengers got a glimpse of a whale shark. We had an easy drift dive over some of the best coral we had seen all week. We saw several sharks, a turtle and large schools of blue-stripe snapper and jacks. Rasdhoo. We finished the day by taking a short walk around Rasdhoo, a local inhabited island. It was really neat to see how the people of the Maldives lived and to see the Maldives from land instead of water. Madivaru Beru. On our last day, we got up extra early in hopes of getting a glimpse of a hammerhead shark at the Madivaru Beru dive site. We dropped in and headed out into the blue at about 30m (100ft). Unfortunately, there was a thermocline at about 20m (60ft), and the cooler water was quite green and hard to see through. After a few minutes of searching, we headed back to the reef (I have no doubt the hammerheads were there, we just could not see them). At the reef, we spent our last dive among the coral gardens, with a few whitetip reef sharks and a huge Napoleon wrasse swimming by. At the end, when we were doing our safety stops, several zebra unicornfish came and swam directly on top of our heads like they were playing in our bubbles. We emerged to the surface, surrounded by turquoise blue water and a dot of green off in the distance, where the dhoni picked us up one last time. The rest of the day was spent relaxing on the picture-perfect MV Leo. I also had the fantastic opportunity to snap a few photos of a much sought-after marine creature—the elusive mermaid. We happened to have a professional mermaid (and scuba diver) on board with us, and she put on her homemade tail and swam around a bit to show us what it is like being a mermaid. 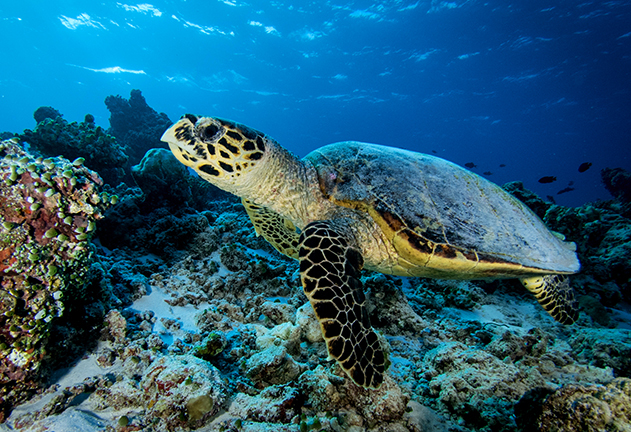 Diving in the Maldives is not for the faint of heart. Many of the dives have very strong currents, which may change throughout the dive. Most of the dives are drift dives, in which the dhoni drops divers in the water at one place and then picks them up wherever the current takes them. Because of the strong current, a safety sausage (and the ability to use them) is required in case of separation from the group. 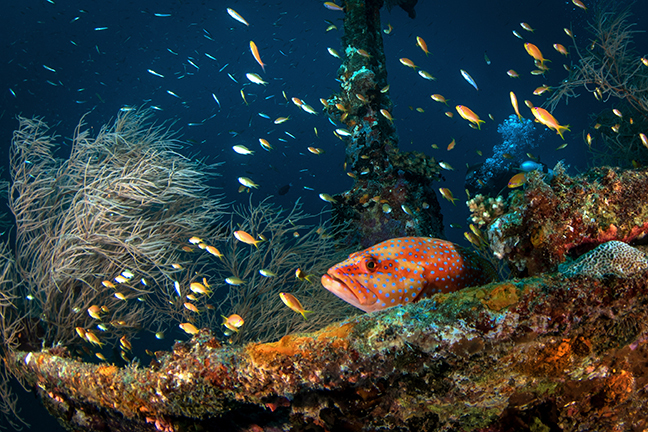 Blue Force does not require advanced certification for this trip, but many other companies doing similar itineraries do, and advanced certification and experience is highly recommended for most Maldives diving. Reef hooks are also a good piece of gear to have. They can be used in the strong current to “hook in” to a rocky area and hold you in one place, without having to use a lot of energy to kick into the current or damaging the reef. The boat separated us into groups of five or six, depending on skill level, and I was really impressed with how they did this. As a scuba instructor and single diver on a liveaboard, it is usually quite hard to get paired up with another advanced single diver, which is just the chance you take when going on a trip without your dive buddy. But I really felt Blue Force went above and beyond to make the diving the best possible for every diver, no matter what their skill level, including advanced divers. I was incredibly lucky in that there were two other instructors, who were liveaboard guests, and I really appreciated that they put us all together, with two other advanced divers, and they allowed us to dive at our skill level. Dives had a time limit of 60 minutes, but our guide let us dive right up until 60 minutes (and sometimes a little longer) on every dive. With the separate groups, we were able to dive at our skill level—while diving within our limits, of course. The Maldives is an amazing place for big-animal sightings, which photographers will love. However, the big animals show up because there is plenty of food in the water, such as plankton and algae, which can lead to limited visibility. This can cause sub-optimal shooting conditions, especially when trying to avoid backscatter. I recommend having long arms on your strobes so you can move them far away from the camera, and angle them slightly, to avoid front-lighting particles. Also, you can try using diffusers on your strobes, turning the power down, or if nothing else, turn the strobes off. On a side note, I was completely amazed by the potential of staying “connected” while on the boat moving throughout the islands, seemingly in the middle of the Indian Ocean. At the airport, it is very inexpensive to purchase a “tourist” package for data and cellular plans. Throughout the trip, I had 3G and 4G internet, and the boat offered free Wi-Fi too. I am not sure if it is a good thing or not, as sometimes disconnecting can be beneficial. But for someone who needs to check in, even on vacation, it was easy to do so (and also easy to share those epic manta photos via Facebook, immediately). As we watched the mantas do back rolls behind the boat one night, one passenger was face-timing with his son, showing him the action in real time, by using a small cellphone—a pretty cool experience to be able to share in real time. On the last day of the trip, after the diving was finished, there was an option to ride with the crew on the dhoni to Malé and take a look around the city while they re-provisioned. It was a tough decision to choose between that or napping on the sun deck, but at the last minute, I decided to check out Malé. Malé is an interesting place. It is the capital of the Maldives and one of the most densely populated places on Earth, with over 133,000 people living on this tiny 5.8 square kilometer (2.2 sq mile) island. Skyscrapers cover the small land mass from end to end, and as soon as you set foot on the island, you are aware of the thousands of motorbikes whizzing through the streets. A local guide gave me a walking tour, showing me where the president resides, several mosques, the local market and the fish market. Outside the fish market were rows of boats, just back from their day out fishing. Friends of my guide let me go on one of their fishing boats and showed me their catch. Then, since it was just me on the tour, he decided to bring me back to the dhoni on the back of his motorbike, where I got to experience, firsthand, what it is like to speed along the skinny streets of Malé, packed with other bikes, people and cars. Seeing Malé was definitely worth skipping my afternoon nap, if nothing more than for the contrast of this busy, bustling city compared to the slow, relaxed life of the other islands. My trip included the Central Atoll Itinerary, which went around North and South Malé Atolls, Felidhoo, Ari Atoll and Rasdhoo Island. 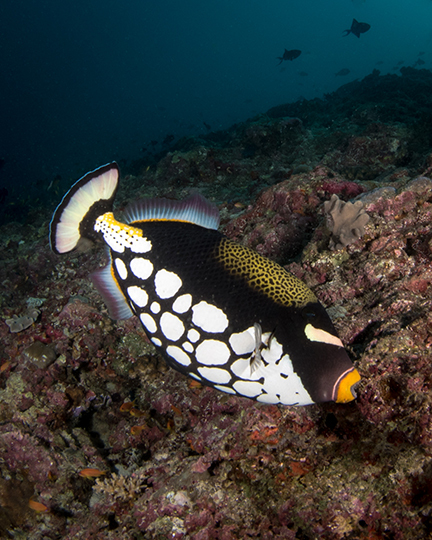 After talking with the dive guides, it sounded like visiting the Southern Atolls was worth a trip back. Accessible only a few months of the year, they told us there was even healthier corals, more big animals, more fish and more remote islands in the area. I felt like we only got a small glimpse of the Central Atolls and could easily come back to the area again, as well. Maldives Blue Force has several special weeks each year when professional photographers, videographers and researchers, such as those with Manta Trust, come on board to educate and dive with passengers. During my trip, we were lucky to have a professional videographer, Rafa Herrero, on board. He shared some of his amazing work, dived with us, and answered questions throughout the week. Blue Force also does family weeks and free diving clinics, so there are plenty of different itineraries to check out on this one, beautiful boat.